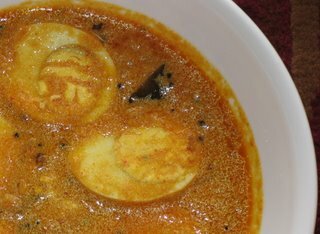 Yet another simple egg curry using coconut. Hard boil the eggs and shell them.Cut them into halves and keep it aside.Grind coconut,red chillies,garlic,jeera into a fine paste.Heat oil in a pan and fry mustard,vendhayam,urad dal.Now add curry leaves and onion and fry till onions are gloden brown.Add the grounded coconut paste,turmeric powder and salt and fry till the raw smell goes and oil separates.Pour this gravy into the eggs and garnish with coriander leaves. Nice mutta curry.. we make it with coconut milk and no mustard seeds. awesum pic n mouhwaterin recipes!!!! keep it up!!!! Sorry i didn't mention water.There is no exact amount of water to add to this curry.You can add abt 1/2 cup to get this consistency as the grounded coconut paste will have some liquid as well. This is wat we cook at home.